Here is an easy to read and interesting book which follows the connection between early nineteenth century socialism and the rejection of orthodox religious morality. It takes us through the political and intellectual journey of the young social agitator, George Jacob Holyoake, who was tried and convicted of blasphemy in 1842. In May, 1842, George Jacob Holyoake set out from Birmingham to walk to Bristol to visit a friend who was imprisoned there. It was a walk of ninety miles and it took him four days to complete. He stopped off at Worcester, then Cheltenham, where he made a controversial public statement on his views of religion, before continuing on to Bristol. This was a journey which changed his life and inspired his enduring dedication to the promotion of secularism, cooperation and freedom of speech. 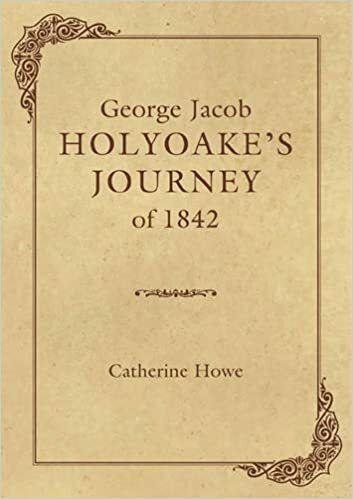 Within the pages of “Holyoake’s Journey”, George Jacob Holyoake’s experience of 1842 has been drawn together for the first time in a comprehensive narrative which addresses early socialism and secularism, as well as religious fundamentalism and theocracy, in a way which is relevant to today’s world. Howe comes to some surprising conclusions regarding Holyoake’s personality which add to the debate on his motivations at the time of his trial and which will interest the informed reader. This is also a book for the general reader who has an interest in social and religious history. This entry was posted on February 21, 2018 by Richard Barton in News and tagged Birmingham, Blasphemy, Bristol, Catherine Howe, Cheltenham, Co-operative history, George Jacob Holyoake, Glos Humanists, Gloucestershire, Humanism, Journey of 1842, National Secular Society, radical history, Secularism.